The TTS SMARTSTEM measures stem thrust and/or torque using bonded resistance strain gages directly mounted to the valve stem. Using proprietary techniques available only to TTS, the patented SMARTSTEM is the most accurate means of measuring loads experienced by the valve stem, as demonstrated at an industry-sponsored validation program. SMARTSTEM transducers are direct replacements of the valve stems supplied by the valve manufacturers. SMARTSTEMs have a calibrated accuracy to ±0.50% of full scale. Transducer measures loads using a strain gage sensing element sensitive to thrust and/or torque loads. Strain is related to thrust or torque during a laboratory calibration. This calibration is traceable to the National Institute of Standards and Technology. 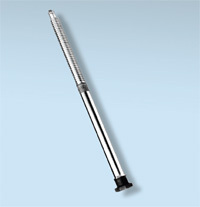 A SMARTSTEM Transducer is a direct replacement of the original valve stem supplied by the manufacturer. The SMARTSTEM manufacturing process is controlled under the TTS Quality Assurance Program, which complies with 10CFR50, Appendix B. Design verification is provided as an option. Calibration certification traceable to NIST is provided for each TTS SMARTSTEM. In addition to the TTS SMARTSTEM, TTS offers a motor-operated valve testing and diagnostic system, QUIKLOOK 3, which provides a nearly instantaneous review of the SMARTSTEM thrust and torque signal data. Utilities operating nuclear power plants agree that the correct functioning of all motor-operated valves, and particularly those in safety-related systems, is of paramount importance. The Nuclear Regulatory Commission has issued Generic Letter 89-10 and other documents which relate to this concern. Operability must be demonstrated under design-basis conditions if practical. Described below is a Teledyne Test Services (TTS) patented transducer that differs from all existing measurement techniques currently offered.